Sunflower is an edible medicinal plant. The tender leaf petioles, seeds and flowers are edible and used in treatment of variety of ailments. Leaves are expectorant, diuretic and astringent. The intake of Sunflower leaf tea helps to reduce fever. The poultice of leaves is applied on sores, spider - snake bites, and swellings. Helianthus annuus is known as Sunflower. In Hindi, it is known as Soorajmukhi or Surajmukhi. The plant is named so as the flower always faces the sun in day time. Sunflower plant has many uses. It is cultivated globally for its seeds which are used to extract oil. It is one of the largest rotating crops in the world, after cereals and maize. Sunflower seeds, contain complete proteins of high biological value and eaten raw or roasted to improve strength and immunity. The seeds are used to extract edible oil, Sunflower Oil which is a very rich in Vitamin E and unsaturated fatty acid. It also contains lecithin, tocopherols, carotenoids and waxes. The oil is used in cooking and cosmetic formulation. Intake of this oil decreases the risk of coronary-arterial diseases and serum and hepatic cholesterol. In cosmetics, it is applied on skin due to its smoothing properties. It does not block skin pores. The oil is also used in preparation of skin conditioners, emulsifiers, cleansers and thickeners. Sunflower seed oil is less warming than sesame oil and considered beneficial in high Pitta body type. 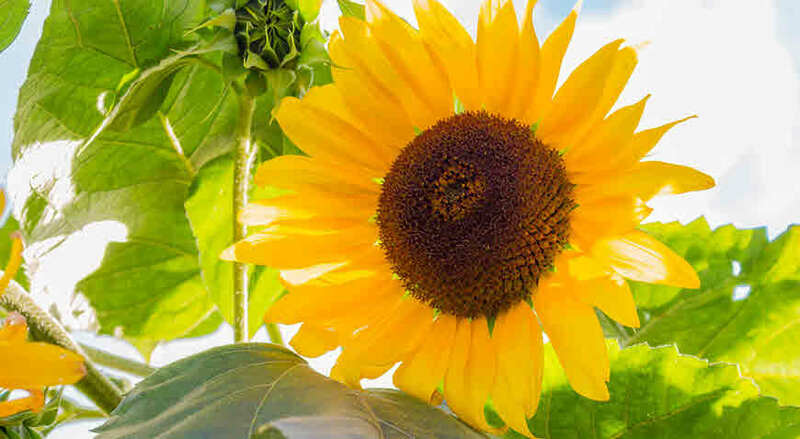 During summer times, body massaging before bathing with sunflower oil is beneficial. The flowers are used to make yellow dye. The fatty acid is used as a base for ointments and creams. The infusion of freshly bloomed ray flowers is used as tranquillizer. It is also helpful in high blood pressure. It reduces fever and used a medicine for malaria. Plant Description: It is a tall undershrub reaching l to 3 m high. There are long tap root and numerous lateral roots. The stem is thick, erect, branchless or branched higher up, densely covered in hairs, and filled with thin white pith. The Leaves are simple, broadly ovate to elliptic, thick-coriaceous, penninerved, lowest pair prominent, sparsely scabrous. The disc flowers are very large. Composite flowers are solitary or in small clusters, usually nodding, and 10 to 40 cm wide on the stems. The bracts in a number of rows are leaf-like, ovate, acute and sparsely bristly. The 20 to 70 asexual, linguiform golden-yellow ray florets are 3 to 10cm long and l to 3 cm wide. The numerous tubular disc florets are androgynous. They may be brown, purple or yellow, with black or purple anthers. Distribution: Cultivated in gardens and fields. Native to central and eastern North America. Habitat: Mild temperature (17-35 degree Celsius), semi-arid regions and full sun. Moist and fertile soil. Not salt tolerant. The botanical name of Sunflower / Soorajmukhi is Helianthus annuus (from Greek helios = Sun and Anthos = flower & annuus = annual). It belongs to plant family Asteraceae, the largest family of the flowering plants and comprises about one tenth of the phanerogamic flora, of the whole world. Few Compositae (Asteraceae) family members are ragweed, mugwort, sunflower, daisy and chamomile. Below is given taxonomical classification of the plant. Helianthus lenticularis Douglas ex Lindl. Sunflower seeds contain a fatty oil (37–48%), rich in polyunsaturated acids (linoleic acid, oleic acid). The oil also contains tocopherols and phytosterol. Steroids: Sterols including campesterol, cholesterol, betasitosterol. Helianthus annuus is rich in medicinal properties. The understanding of these properties will help us to better utilize this herb. Sunflower seeds are very nutritive. Eating half cup (64gm) of dry roasted sunflower seeds provide energy (370 kcal), dietary fibres (7gm) and proteins (12 gm). This will also provide vitamin E (17mg), niacin (4.5gm), pyridoxine (0.5mg), pentothenic acid (4.5mg) and folic acid (151mcg). Calcium, copper, iron, magnesium, manganese, selenium, phosphorous, potassium, sodium and zinc are also present in seeds. Eating 100 grams of seeds will provide 40 percent of daily required protein and 34 percent of fiber. They are an excellent source of vitamin E /tocopherol, an antioxidant. They are a good source of copper, iron, zinc, Magnesium and potassium. They contain both monounsaturated and polyunsaturated fat. They reduce the risk of colon cancer. They are useful in reducing stress, anxiety and depression. Folate present in seeds support RBCs formation, blood circulation, nerve function, and protect against congenital malformations. They protect against cardiovascular disease. They reduce the LDL cholesterol and total cholesterol. They improve memory and various cognition systems in the brain. They are antioxidant and anti-carcinogen. They can be eaten as a part of weight reducing diet. They fight symptoms associated with PCOS (poly cystic ovary syndrome). They are beneficial in chronic inflammatory conditions, bacterial and fungal infections, cardiovascular diseases, skin diseases bronchial asthma, muscle cramps, hypertension, and migraine. Sunflower is an edible medicinal plant. The tender leaf petioles, seeds and flowers are edible and used in the treatment of a variety of ailments. Leaves are expectorant, diuretic and astringent. The intake of Sunflower leaf tea helps to reduce fever. The poultice of leaves is applied on sores, spider – snake bites, and swellings. The flowers can be steamed and eaten. Sunflower seeds are roasted and available in market as snack food. The seeds are ground to make powder or flour. Sprouted seeds are also eaten as food. The seeds offer numerous health benefits. Sunflower seeds are very nutritive. They are expectorant and give relief in excess phlegm, cough, cold, bronchial and pulmonary infections. Due to diuretic properties, the seeds helps in urinary problems. The Sunflower oil is given internally to alleviate internal dryness and thus relieving constipation. The Sunflower Oil is applied as oil dressing on skin lesions, psoriasis and rheumatism. In folk medicine the seeds were given. Leaf paste is applied over the forehead. Seed or plant decoction is prepared and given. Sunflower oil is used both internally and externally. Rub sunflower oil onto scalp and the soles of your feet at bedtime. The seeds powder 3grams + Mishri 6 grams, is eaten for 2 weeks. The paste of seeds are eaten in a dose of 10 grams. The seed powder 3 grams, is given 2-3 times a day followed by castor oil. Oil extracted from the seeds are applied. Soak seeds in water to soften them so they are easier to digest. Eat five at a time. Leaf decoction is used as a wash. The seeds are eaten in a dose of 3 to 10 grams. Availability of Sunflower seeds for Eating Purpose: Roasted Sunflower seeds are available online and at stores. Online packet of 100 gram is priced around Rs. 150 to 200.00. This should be kept in a tightly sealed containers protected from light. Plant extracts may cause allergic reactions.